Integrating Research and Education > Teaching Phase Equilibria > What are Pseudosections? A pseudosection, also called an equilibrium phase diagram, is a type of phase diagram that shows the fields of stability of different equilibrium mineral assemblages for a single bulk-rock composition. Pseudosections are generally simpler and much easier to interpret than standard phase diagrams that show many reactions. Isn't it the Same as a Petrogenetic Grid? No. A petrogenetic grid shows all the reactions that will occur in a model system (e.g., ASH, or Al2O3-SiO2-H2O). However, some bulk compositions will not "see" those reactions. 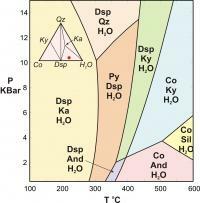 For example, the diagram on the left above is a standard PT phase diagram for the Al2O3-SiO2-H2O (ASH) system. The diagram on the right is a pseudosection for one particular composition (shown by the red dot in the inset triangular diagram). 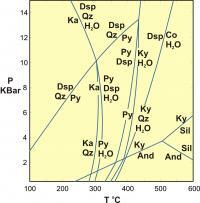 The PT diagram shows reactions; the pseudosection shows fields of different stable phase assemblages. The reason that pseudosections are not the same as phase diagrams is because of the composition chosen. Two AFM diagrams (for the system KFMASH, or K2O-FeO-MgO-Al2O3-SiO2-H2O) are shown below. The difference between the two is that there is a tie-line flip reaction of Grt+Chl=St+Bt. However, if the rock has composition that plots in the Chl+Ky field near the top right, then it is unaffected by this reaction. 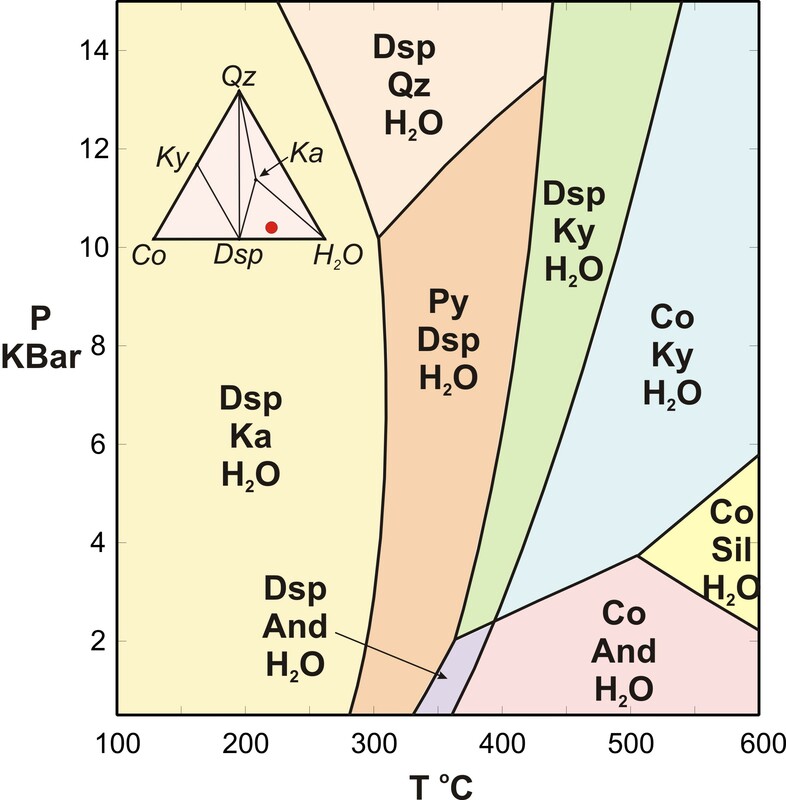 So, the reaction will be included on a standard phase diagram but would not appear on a pseudosection for a rock with composition in the Chl+Ky field. 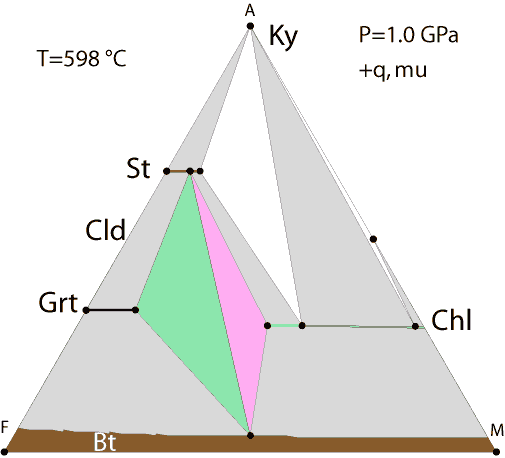 Animated GIF (click on image to see animation) showing how mineral assemblage and modes vary with temperature. The composition shown by the small circle originally starts out as a Bt-Chl assemblage. 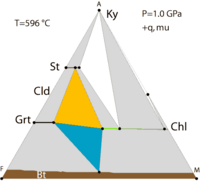 As temperature increases, the yellow triangle "moves" to the right, chloritoid joins the assemblage and eventually almost all the chlorite disappears. Figure from D. Hirsch. Another reason why standard phase diagrams and petrogenetic grids differ from pseudosections is that standard diagrams do not include continuous reactions, only discontinuous ones. 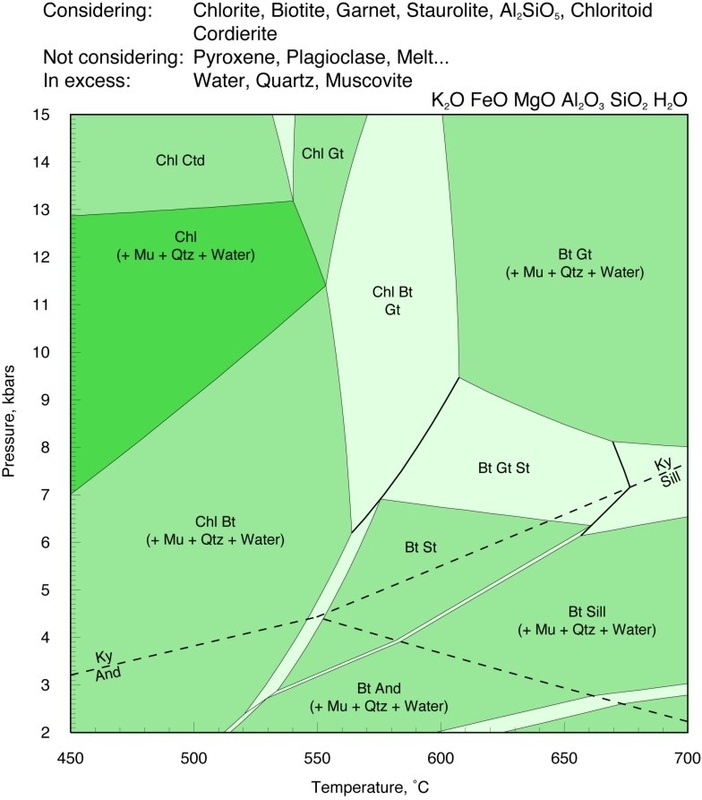 However, as a field sweeps across a ternary diagram, new phases may be introduced into or removed from a rock with a particular bulk composition. These changes in mineralogy are shown explicitly in a pseudosection, and not at all on a petrogenetic grid. This is shown in the animated AFM diagram shown here (above right; click on the diagram to see animation.) The bulk composition signified by the small circle initially contains only Chl + Bt, but as temperature rises, it gains Cld as well. 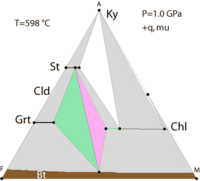 This change in mineralogy would not be evident at all on a petrogenetic grid. The example ASH pseudosection shown at the top of this page can be easily calculated by starting with a standard phase diagram, creating compatibility diagrams for each field, and checking to see what happens for a particular bulk composition. However, when the number of components is larger than 3, and especially when minerals are complex solid solutions, drawing compatibility diagrams and creating pseudosections are much more difficult. The drawing shown here (left) is a pseudosection for the 6-component KFMASH system. Equilibria involving 10 phases were considered. Pseudosections like this one are extremely difficult (really, they are impossible) to calculate by hand. They involve many phases and the phases change composition as P and T change. 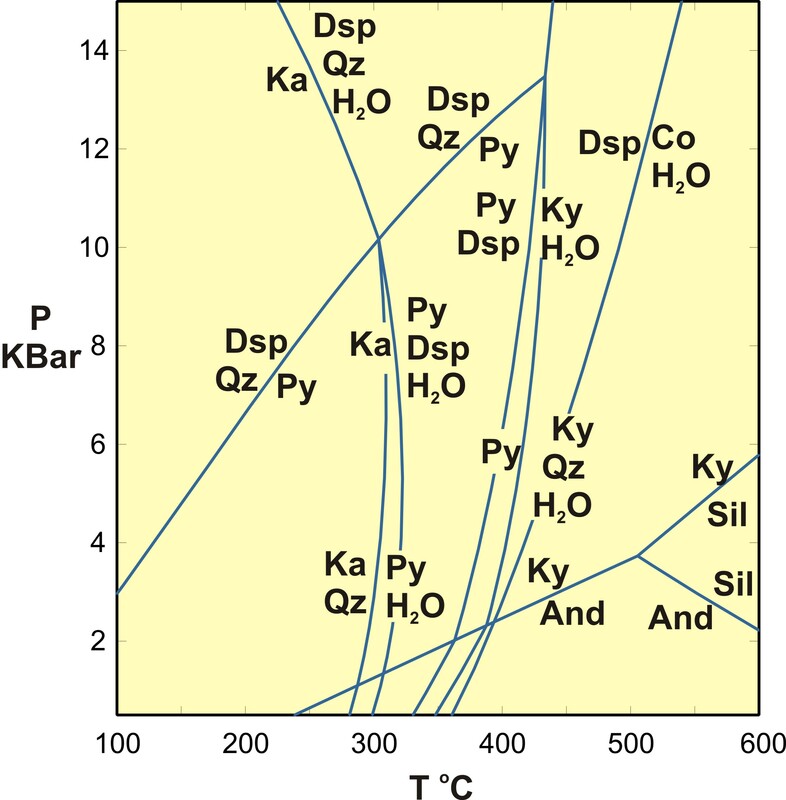 So, to calculate diagrams of this sort, petrologists routinely use phase equilibria modeling programs. 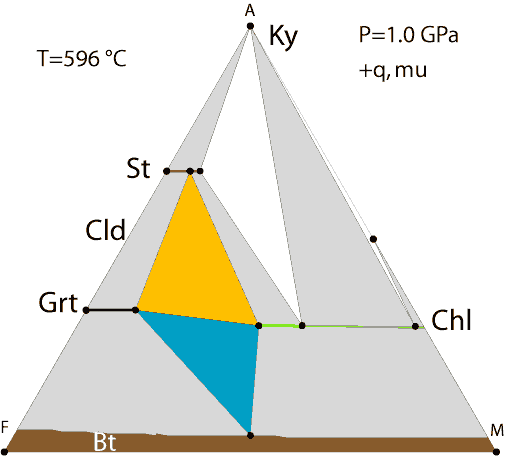 The diagram shown here was created using THERMOCALC. A very similar diagram is obtained if Perplex is used instead.